Apple’s newest iPad has some new elements that could make it a (bigger) hit in the enterprise, such as a higher-resolution screen for video conferencing and presentations as well as taking dictation. But it has become increasingly clear to corporations that their networks can’t handle the iPad or, really, most of the devices employees are bringing into their walls. We have done a lot of coverage on how iPads have made inroads into the enterprise, with 64 percent of mobile workers now carrying a tablet, and that will rise to nearly 80 percent within the next six months, according the Mobile Workforce Report (you can see the iPad breakdown below). In general, the number of mobile devices coming into corporate networks has grown to 3.5 devices, up from 2.7 in 2011, according to the same report, which was released earlier this week. But the problem with iPads and mobile devices in general is that they move, and so your network resources have to move too. Or at least adapt to ensure that when someone has an impromptu meeting by the water cooler, there is enough network capacity to serve those devices. Before, when people computed and connected from their desks, it was much easier to predict where the network needed to have the most capacity. The nature of traffic today is increasingly dynamic. And so the old ways of addressing and building networks, with very statically provisioned technologies, like circuit switching, is essentially dead. So you have to rethink this architecturally. Point number two is that I believe that the traffic is going to get a lot more stochastic in nature. In other words, unpredictable, both with respect to any given circuit and with respect to the sources and destination the amount of usage will continue to explode and they will get more and more dynamic and unpredictable. Companies also have to figure out how to revamp their corporate device policies to ensure data is kept secure. 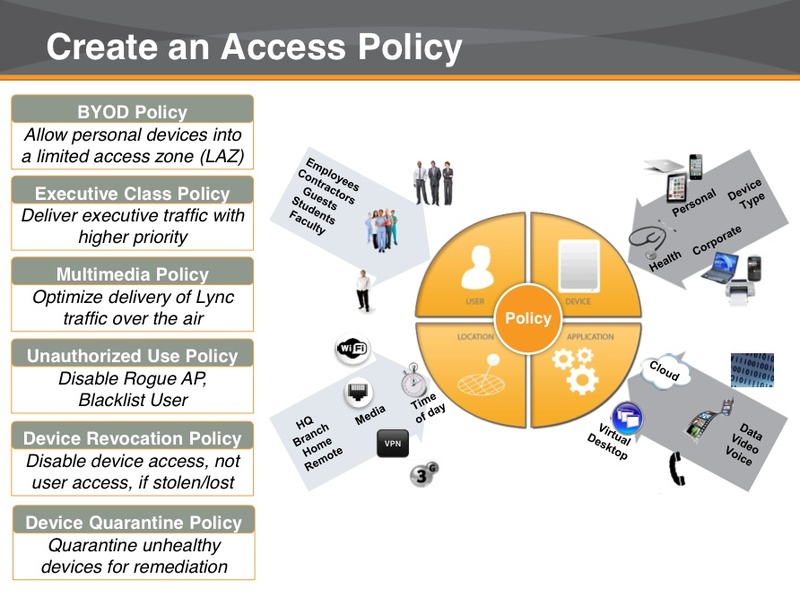 Aruba, a wireless equipment firm, offers this slide to explain all the considerations an enterprise must think about. As the new iPad launches with better screens and better video conferencing and presentation capabilities, those responsible for corporate networks are a wee bit concerned. Depending on whom you ask, some are very concerned. Brocade, which on Tuesday launched a series of products that makes corporate networks programmable and flexible, polled 120 IT managers and found that about half are worried in some way about anticipate traffic changes thanks to the coming iPad. And even if the iPad isn’t mentioned by name, the trend of bringing in consumer devices to the network is leading to opportunities not just for firms making tablets such as Apple but also those on the back end charged with building and securing corporate networks. Companies like Brocade, Aruba (s arun), Cisco (s csco) and others are watching today’s launch and hoping it drives a few more CIOs to ring up their salesmen. I love the new additions to the latest iPad and I love the fact that it will still fit in my iBackFlip Somersault sling pack. this thing is awesome and I couldn’t art with it! If you have never seen it check them out at ibackflip.com ! I take my samsung tablet everywhere – and my biggest gripe is not the network or the processing speeds, but a reliable CRM and ability to do “simple” tasks like copy and paste as easy as I can at my desktop. The android based phones/ tablets I think have more free apps., but the apps themselves need to be better. While iPads are really wonderful, I believe we should be asking the question: Are we working more efficiently? I have my doubts, but I enjoy the entertainment value of the iPad. A great time waster! what ‘s the different between 3G and 4G? It’s inexcusable that IT is so far behind. Neither employees nor CEOs should accept ‘reasons’ why IT can’t support mobile devices or the BYOD world. There are so many solutions to these problems that it’s entirely a question or forethought and money. Some companies may choose not to reply wireless because of cost. In very low-margin businesses this makes sense. For businesses who make their money off knowledge workers it makes no sense at all. There are lots of uneducated, ill-considered things going on in business – and they should be called out for what they are, not pandered to. I think everyone ignores the fact that what is being asked for is the ability to carry a device like a tablet and, at any time, consume large amounts of resources. Who needs to, regularly, do a video conference while they’re walking around the office? We’re so accustomed to “I want it now, my way” that we don’t stop to think about the effects of our actions, security, accountability, legal issues with communications and logging/auditing, and other aspects. How do these communications fit into SarBox and transparent processes and communications, and corporate “Acceptable Use” policies? Is there any technology available to make the arquitecture more flexible and have the infrastructure leased on site or else but when required by iPad get that bandwith On Demand mode or so? Did I miss something here? Sure the Ipad3 has a faster processor and higher screen resolution (so more HD youtube say), but the corporate network infrastructure isn’t necessarily going to be hit – the biggest change is the use of 4G LTE – and that’s going to hit the Telco’s (and I think they’ll welcome and charge for the traffic). You would think GigaOM writers would do a better job of playing off of articles. Om are you listening ? I would like to have device with all pc functions ,laptop functions with full phone qualities and access around the world on single network with normal network rates. Then I will say this is real innovation. I’ve did I.T. for 25 years and don’t see the big deal with using iPads in the Enterprise as long as you know their limitations. As long as you don’t need to type lots there are MANY other things that make using an iPad better than lugging a laptop/netbook. The tech’s have always been ahead, welcome to the cloud. Its high-definition display is useless for video-conferencig, since the front camera resolution is only VGA (0.3Mpx), whereas other Android tablets equip 1.2Mpx HD cameras. I have tested video-conferencing using Skype on an Asus Transformer Prime and it works nicely. Andrew Hillier: Although savings and agility are both compelling benefits, it’s usually agility that’s realized first. This isn’t because it is a higher priority, but because it occurs earlier in the cloud adoption process. The push toward standardization and self-service can rapidly increase flexibility and decrease provisioning time, but can actually work against efficiency (much to the surprise of many cloud adopters). The resulting environments are difficult to manage, and many organizations end up with higher spend (for external clouds) or much lower density (internal clouds) than they originally envisioned. Fortunately, by adopting more sophisticated methods of planning and controlling these environments, workload placements and resource allocations can be safely optimized, eliminating over-provisioning once and for all and turning the cloud adoption process into the “win-win” that was originally targeted. I fail to understand how the iPad is different than a smartphone when it comes to the security aspect. You can have similar apps (or the exact apps if you have an iPhone) on your smartphone. Why is the iPad singled out? Steve Ardire, you need an attitude adjustment / paradigm shift. Calling a contributor uncomplimentary names makes you look bad NOT the person you derided. Steve Ardire, I do NOT take orders from you. I will contribute whenever I want to. Furthermore, my comments are NOT “drivel.” Your response to me reinforced the validity of my initial comments. It’s ok, Sharon, Steve is an “advisor”. Presumably that implies that he doesn’t “do” or “know” just advises startups. I wonder how many get further that startups? I was thinking exactly the same point, why would you give execs priority over customer facing staff? Any successful business would want to be able to serve your customers as the first priority and then the rest can share the rest between themselves. Again symptomatic of IT trying to drive corporate strategy without actually understanding the business and what drives your revenue (ex-IT manager now managing front line operations). I often suggest that everyone in an organisation ought to share the same “rubbish” service… That way no one is under any illusions about what really happens at the coal face. Happy for you Steve. As they say – others do while consultants talk. Perfect for sending links to others articles, making oneself look more erudite. Sweet! Do you clients have anything to do with the reason your foul mouthed ? BYOD is here to stay. Indeed, how long will it be before new hires are asked by IT if they even need a device at all? This a paradigm shift in which the personal devices space (smartphones) collides with the corporate device space (desktops and laptops)- at the intersection is the iPad (I mean, the tablet space, if people start buying something besides Apple), which probably suffices for 70-80% of white collar computing needs today, maybe more. 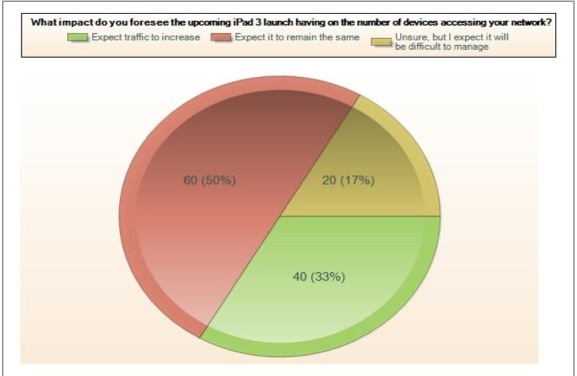 Perhaps it’s nitpicking, but regardless, the Brocade survey you cite as indicating finding that “about half [of IT managers] are worried in some way about the coming iPad” doesn’t indicate that at all. Problem is, to get to 50% you have to include the 33% who say they “expect traffic to increase” and then apparently leap to the conclusion that the expectation of increased traffic equates to “worry”, whereas that is not at all a logical conclusion. All 33% could be completely unconcerned either because of their existing network capacities or existing abilities to increase capacities as needed. The only clear conclusion to me is that 17% are “unsure but expect it will be difficult to manage”, which hardly seems like a crisis – unless, of course, the survey sponsor’s products are developed to serve that ostensible need and they feel compelled to make the figures fit. Dave, that’s true and I’ll adjust that wording. That’s why I didn’t rest the whole story on Brocade or even the iPad, because it is a symptom of an overall shift. This # is from iPass who see’s 1/10 or less of travelling traffic, that coupled with the fact that companies that use iPass are already blowing $ out the door (Ticker ipas) leads be to find this number very questionable. The high resolution screen has nothing to do with video. It’s the ultimate Microsoft killer. It enables better PC virtualization capabilities. Very smart to make the resolution of remote documents even better no matter the size. I’m not sure what the difference is between an iPad and a laptop running wireless. The last 3 places I worked, the IT group has been migrating away from hardwire to save installation and maintenance costs. Most folks are using laptops unless they are running high end design tools. And even many of those folks are on laptops. What does it matter if I bring a laptop or iPad into the conference room, beyond how the IT group manages the security? With your attention distracted by Pandora, and LiveWeatherStream, I hope your work is rote. Please spare me the claim of multi-tasking; there is too much empirical evidence it is not conducive to quality work. More likely people will use a laptop at their desk while still having a tablet and a phone with them as they walk around…so the number of networked devices per person, is on the rise. 1. At least one additional device beyond the laptop. Many college CIOs are now telling us 4 to 6 devices per student. 2. Increased network use in general, but also repetitive application tasks such as syncing your email to your phone, tablet, and laptop. 3. While neither 1 & 2 are a big deal at a small scale, these additions add up to consume lots of RF as the number of users increases. Consider the quality of the WLAN at the last conference you attended. RF is a shared medium which means a wireless first environment will (often) need a better WLAN than what went into the conference room in the first place. The last consideration beyond the device security bits is to upgrade the wired network to deal with higher speed WLANs. The good news is that in some cases you can get away with a smaller wired network than what you had before. Disclosure: I work for Juniper Networks and we have a few horses in this race. > But the problem with iPads and mobile devices in general is that they move, and so your network resources have to move too. Huh, hybrid cloud *may* work for app, but it doesn’t magically add more local network bandwidth for a facetime user standing next to the water cooler connected to your wifi network going through your network infrastructure and hogging all precious bandwidth leading up to your upstream network provider. Steve Ardire, more bandwidth isn’t always available, or if it is, it is often over-priced due to psuedo-monopolies. We don’t all live in Chattanooga or Kansas City or Japan (i.e., places that have affordable high speed internet service). No kidding Steve. While kowsik sounds like an IT mgr luddite, you meanwhile seem to be busy “Shaping serendipity by interrogating reality to identify, elucidate, illuminate the connective patterns for success.” huh! Missing Since 12/18/2011 From St.Louis, Missouri. Location Last Seen: Phoenix was last seen leaving out of her driveway in her vehicle (1998 4-door Chevrolet Blazer with tinted windows: Missouri License Plate KE2S6V). If you have any leads or tips please visit http://o4lm.com/phoenixcoldon.html to submit your info thank you, and may god bless! Some of us just arenâ€™t geared to accommodate complete Wi-Fi access so if people are operating outside an access point then they should re-locate and find one.